M@r1a Ransomware is a threat that you do not want to let into your operating system because the moment it gets in, it starts encrypting files. Once files are encrypted, their data is modified, which makes them unreadable. The infection is meant to corrupt users’ files and ensure that they have no other option but to pay the ransom. Of course, you have the option of not paying the ransom at all! Even though the ransom requested by the creator of this malware is relatively small (US$50), it is still money that you are unlikely to put to good use by paying the ransomware. If you pay as instructed, it is most likely that you will not hear from your attackers again. Of course, you have to decide which risks you want to take and which battles you want to find. If you continue reading, you will find information that will help you decide what you should do. Needless to say, regardless of the path you take, in the end, you need to remove M@r1a Ransomware, and that is something we can help you with as well. Did you know that M@r1a Ransomware belongs to a family of malware? Other threats that are linked to it are Spartacus Ransomware, Satyr Ransomware and Blackheart Ransomware. Our research team has analyzed and reported every single one of these threats. Though it is possible that their creators are unique, it looks like they share many similarities. For one, these threats work from the launch location. That means that M@r1a Ransomware does not create any other files or registry entries to run. After execution, the infection starts the encryption process immediately. Although it bypasses files stored in such directories as %PROGRAMFILES% and %WINDIR% to ensure that the system does not crash, it can encrypt tons of personal files. Files with such extensions as .exe, .mp3, .gif, .zip, .rar, .doc, or .pdf are definitely on the infection’s radar. The files that are encrypted are easy to discover because the “.mariacbc” extension is added to their original names. Unfortunately, if you delete M@r1a Ransomware, your files will not be recovered. You can restore them only if you have a decryption key, and no one can promise you that. The malicious M@r1a Ransomware creates a file called “ReadME-M@r1a.txt.” It is created on the Desktop and in the %HOMEDRIVE% directory. The message inside the file asks the victim to contact the creator of the infection via Telegram @MAF420 or via email at farhani.ma98@gmail.com. 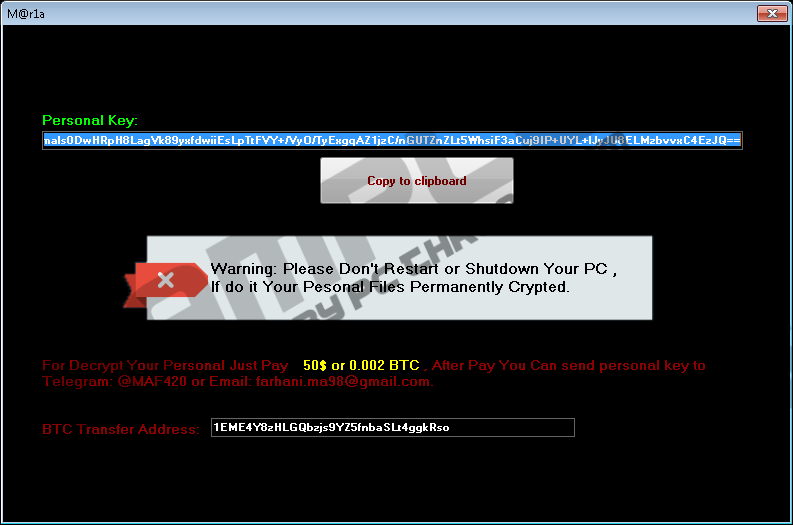 The threat also launches a window with a Bitcoin Wallet address (1EME4Y8zHLGQbzjs9YZ5fnbaSLt4ggkRso) and a sum (US$50). It appears that the creator of the infection wants you to transfer a ransom worth $50 in Bitcoins to their wallet. Should you do it? That is up to you. Just remember that it is VERY unlikely that you would get your files decrypted if you paid the ransom. Hopefully, you do not need to think about this at all because your personal files are backed up. You are not lucky if you used internal system’s backup to protect your files because the ransomware can delete Shadow Copies by executing the "cmd.exe", "/c vssadmin.exe delete shadows /all /quiet" command. In the future, go with cloud or external drives for backup. You need to delete M@r1a Ransomware; no one can deny that. After all, it is an infection. But what are you supposed to do beforehand? You might be tortured by the idea of losing your files and losing all options to recover them, but the reality is that you are unlikely to have any options at all. Shift your focus from the ransom to the removal of M@r1a Ransomware. If you cannot find and delete malicious ransomware components yourself, you can use the help of anti-malware software. It will quickly and effortlessly clear your operating system from all malicious infections, including the ransomware. If you have any questions that were left unanswered in this report, or you need help with the removal of malware, post a comment below. Our research team will try to assist you as soon as possible. Empty Recycle Bin and then perform a full system scan using a legitimate malware scanner. N.B. To access any directory, enter its path into the field at the top of Windows Explorer (tap Win+E to open). Quick & tested solution for M@r1a Ransomware removal.